Western media has received video and photos of propaganda from alleged “activists in Aleppo”. And western media is spreading this propaganda like wildfire. Fact: The Obama admin wanted Assad out so that the current democratic system of government would be replaced with an Islamic one. These photos and video are faked and are propaganda -- they are not worth feeling pity over -- they are meant to trick you. This propaganda is designed to make you think “Government Forces” or “Russian Air Strikes” have hit civilians. This is a lie. Instead of pity, feel outrage that your media is part of Obama's propaganda campaign. Take a good look at the video (bottom of page). At the beginning of the video, the little boy is handed from the dark. You are not shown the rescue. The young boy, who “appears” to be wounded, sits quietly, not crying, in a spotlessly clean ambulance. Let me tell you, the ambulances in war-torn Aleppo are not spotlessly clean – real ambulances are battered and war-torn and show evidence of it. Real ambulances receive bloody casualties non-stop and they cannot be kept spotless. In the video, the little boy is placed on a chair where he then sits unattended. There are no attempts to soothe him, no one looks at his “wounds”, let alone attends to his “wounds”. No, the little boy is put on the chair, where he is then on “display” for you, the westerner. He is made to look small and lonely -- while about 15 men take photos of him. That is not what the real people of Aleppo do. The little boy touches the “wound” on his head, sees that he has disturbed the “red paint” and looks a bit worried he might get in trouble for wiping it off. He does not look alarmed that he has “blood” on his head, nor does he cry -- because he knows it is not blood. For those of you who have kids, you know that if they saw blood coming from their head, they’d be frightened, and most kids would start crying. This little boy knows he disturbed paint. And for those of you who know head wounds, even the most minor ones, they bleed a lot. This is a staged head wound. There are about 15 men standing around the scene. Again, this is not typical in an actual bombing site. In Aleppo, civilians are keen to be helpful and are always tending to friends, family and neighbors. Or they are out looking for them. And there are always women around -- but not in this scenario – because its faked. This was filmed in an "opposition" held neighborhood, where it could be staged, and that is why there are no women. The "opposition" are Islamists. Added to that, in the original video, which I’ve seen, you hear the men say Allahu Akbar repeatedly (they’ve now added sound that covers up the voices). The only people who say Allahu Akbar are terrorists. I have never, in all the years of reporting bomb sites and the aftermaths of bombings, have ever heard civilians say Allahu Akbar. At the sight of someone being saved, they may say, Oh God (yah-rob), or Thank God (al-hamdililah), but they do not say Allahu Akbar. At one point, you see a person in the background wearing a White Helmet. And there you have it: the final damning evidence that this is yet another staged propaganda video created by the notorious White Helmets. The propaganda media sites send out these types of videos whenever they are losing a battle, or, when the terrorist groups they represent are killing civilians and they want to blame it on the “regime”. The only groups that target civilian areas are the "opposition" groups, which are all foreign Islamic mercenary groups. The Syrian armed forces do not target their own family, friends and community. Syrians are fighting foreign terrorist groups, not their own people. The White Helmets was not created by Syrian nationals, nor does it serve the interests of the Syrian state or its people. 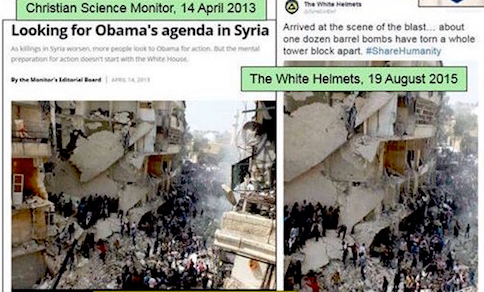 The White Helmets was created by a collaboration of Islamists inside the US and UK in 2013. The White Helmets claim on their social media sites that they are “nonpartisan” rescue workers. But their photos always show them conducting “rescue” work in "opposition" held areas that have been destroyed months or years earlier and are locations that civilians evacuated. These locations are perfect for their "staged" propaganda photos. The White Helmet "rescue" workers shown in their propaganda photos have been filmed socializing with opposition, participating in civilian executions, and waving al-Qaeda, al-Nusra and other “opposition” flags. It has been repeatedly proven that the “rescue” workers are members of the opposition and that they stage the photos. Often the same photos are shown repeatedly year after year, with new claims that they are separate events and in different cities (see photos below for examples). Since its creation, every White Helmet report demonizes and blames Assad, using the propaganda terms “regime forces” or "government forces" and encourages western intervention. White Helmet reports have made it into the Washington Post, Los Angeles Times, New York Times and many other mainstream media reports. Though they have a website, they are most active on Twitter and Facebook, and this is where mainstream media usually takes the false claims and then reports them as “truth”. 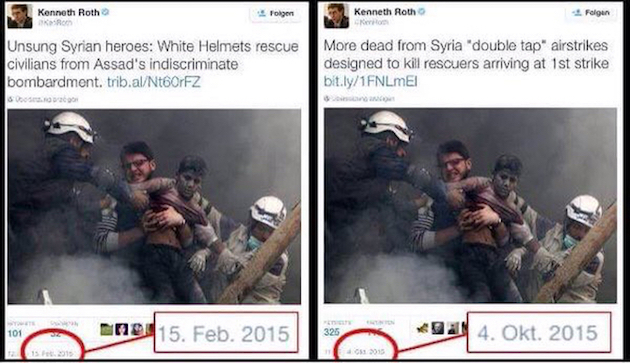 Photo Left: An example of the same photo used for two different occasions, eight months apart, both shifting the blame on Assad. Photo Right: The same photo is used for two different occasions, four months apart. All four examples were White Helmet propaganda to fool the West into thinking the Syrian armed forces are doing this to their own people. ​The Syrian government is freely elected by the Syrian people and consists of Christians and other minority groups and is well represented by women. A woman was recently elected head of Parliament. CLICK HERE for information about the most recent democratic elections, April, 2016. CLICK HERE for the official statement by the international monitoring group which declared that the Syrian presidential election of June, 2014 was well represented by Syrians from all sectors of society and proved that the Syrian people back their government and elected president. Photos below: using chicken blood, a fake scene is created. Woman and boy bloody themselves for a mother-son fake scene. Western media feeds this to you and you believe it every time.